There was nothing in the beginning but seemingly almost endless chasm called the Ginnungagap. Ginnungagap was a void like the Greek Chaos. Ginnungagap was bordered by Niflheim, which is the place of darkness and ice, far to the north; and Muspelheim, a place of fire, far to the south. Out of this chaos the first being came into existence from the drop of water when ice from Niflheim and fire from Muspelheim met. Ymir grew so large and so evil that the three gods killed Ymir. The blood that flowed from Ymir's wound was so great that almost all the frost giants drowned in the torrent. Only the frost giants Bergelmer and his wife escape the flood in a chest, arriving on the mountain of Jötunheim (Jotunheim), which became the home of the giants. Odin and his brothers then used Ymir's body to create the universe. This universe comprises of nine worlds. They placed the body over the void called Ginnungagap. They used his flesh for creating the earth and his blood for the sea. His skull, held up by four dwarves (Nordri, Sudri, Austri, and Vestri), was used to create the heaven. Then using sparks from Muspelheim, the gods created the sun, moon and stars. While Ymir's eyebrows were used to create a place where the human race could live in; a place called Midgard (Middle Earth). A great ash tree called Yggdrasill ("World Tree") supported the universe, with roots that connects the nine worlds together. One root of Yggdrasill extends toMuspelheim ("world of fire"), while another root to Niflheim (the "world of cold" or "of ice"). Niflheim was sometimes confused with Niflhel; Niflhel being known by another name – Hel, was the world of the dead. Hel was sometimes used interchangeably with Niflhel by many writers, as the world of the dead. The name, Yggdrasill, means "Steed of Ygg". Ygg is another for Odin, which means, "Terrible One". Therefore, the great tree means in English, "Steed of the Terrible One". Odin's horse is named Sleipnir, but I found no connection between the tree and Sleipnir. While one root was connected to Asgard (home of the Aesir), another root to Vanaheim (home of the Vanir). The frost giants lived Jötunheim (Jotunheim). Midgardwas the world for human. Alfheim was home of the light elves (ljósálfar). There was also the underground world for the black elves (svartálfar), called Svartalfheim. The dwarves inhabited the world of Nidavellir. The Norns guarded the Urdarbrunnr, which is often known as "Weird's Well", "Wyrd's Well" or "Urda's Well". The Weird's Well was considered to be very holy. The Norns were Urda or Weird or Wyrd ("Past"), Verdandi ("Present") and Skuld ("Future"). Two swans drink from this well. Each day, the Aesir sit at the court at Weird's Well. Horses take the Aesir to this court. Odin rides Sleipnir. Ten other horses were given names: Glad, Gyllir, Glær, Skeidbrimir, Silfrtopp, Sinir, Gils, Falhofnir, Gulltopp (belonging to Heimdall) and Lettfet. Balder's horse was burned with him. Apart from Sleipnir and Gulltopp, no specific horses were assigned to a particular god. The Aesir must ride across Bifrost (Rainbow Bridge) to reach Weird's Well. Thor doesn't bother to ride to attend the court. Thor walked and waded through the rivers, Kormat and Ormt and two Kerlaugs. The second well was Mímisbrunnr (Mimisbrunnr) or the "Well of Mimir", which was also known as the "Well of Knowledge". The well was said to be guarded by the Aesir god named Mimir, a Norse god of wisdom. 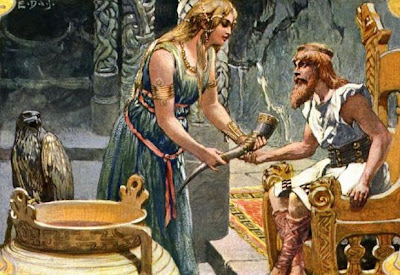 See the Well of Knowledge in the Search for Wisdom on how Odin pay Mimir to drink from this well. The third well was called Hvergelmir or the "Roaring Kettle", where a giant serpent called Nidhogg, continuously gnaws at the root of Niflheim. Eventually, Nidhogg will eat its way through the root that will cause Yggdrasill to collapse. But this won't happen until Ragnarok finally arrived. Nidhogg also liked sucking on the bodies of the dead.